"Burning Down the House" has been a strong arc, but sadly, the resolution is a little lacking. 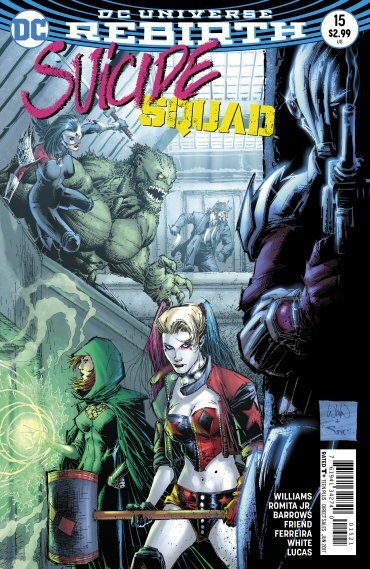 Still, this issue of Suicide Squad bodes well for the future. “Burning Down the House” has been a tremendous arc – and it’s finally coming to a head! 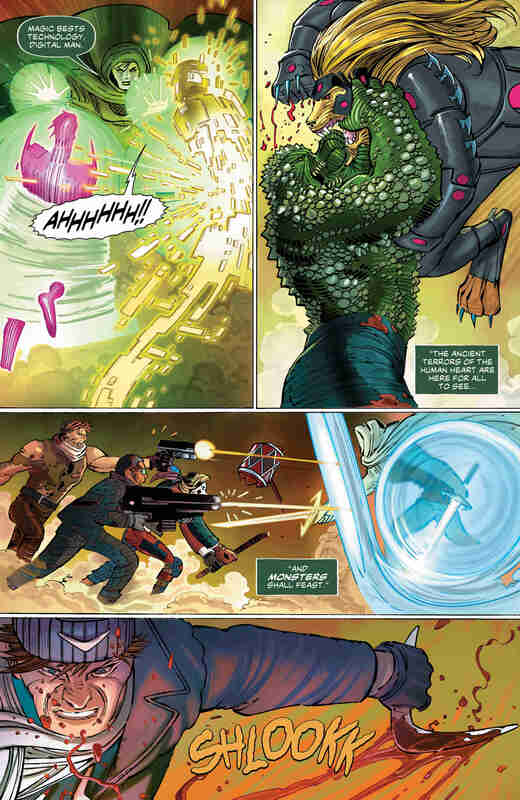 There’s a sense in which Suicide Squad #15 is the perfect conclusion to this story. It has all the strengths of the arc – and, sadly, all the weaknesses. There’s a sense in which Rob Williams has set himself an almost insurmountable challenge. 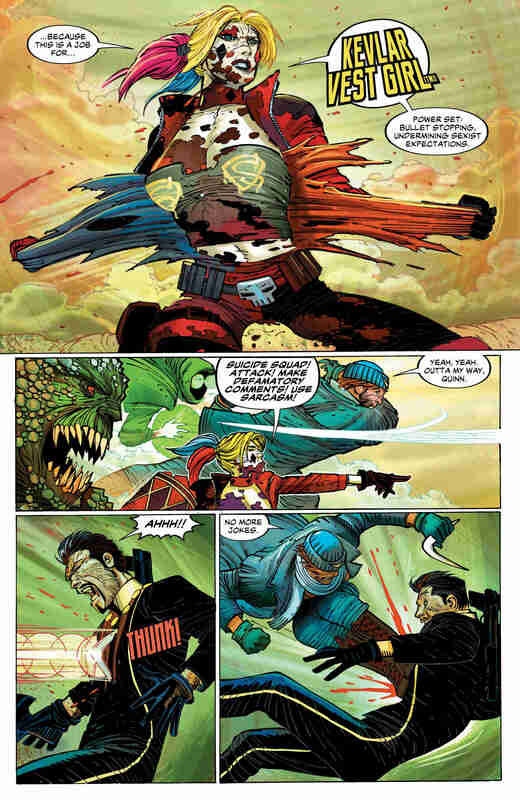 “Burning Down the House” tore the Suicide Squad apart, with Waller killed, Deadshot a traitor, and Hack murdered. It’s all led to a climax – but sadly, the outcome is fairly predictable. All the clues and hints are tied together in a bow, but it feels somehow lacking. Perhaps that’s partly because I’ve never been a fan of the ‘it was magic’ explanation; it’s too convenient a hand-wave. 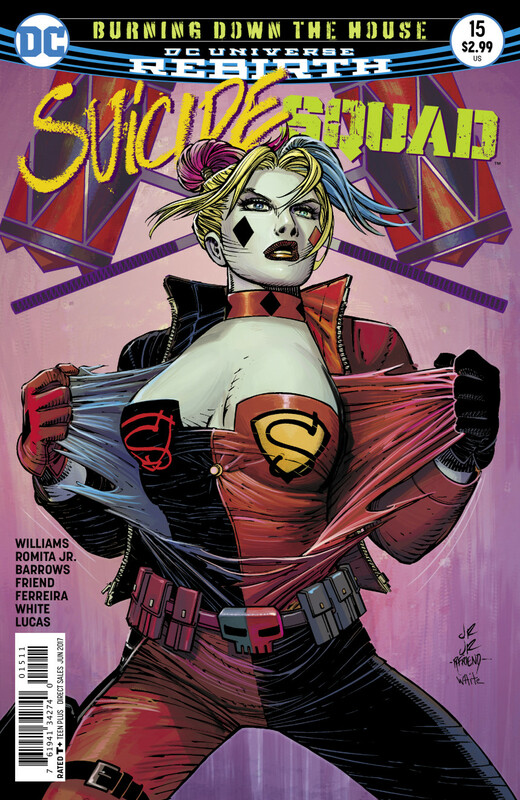 Suicide Squad #15 follows a pretty traditional arc. It opens with an all-action sequence in which the bad guys are taken down, and we suspend logic as much as possible. The seemingly-spontaneous gathering of Suicide Squad is actually Waller’s plan all along, Harley’s mallet somehow cut Katana’s bonds (? 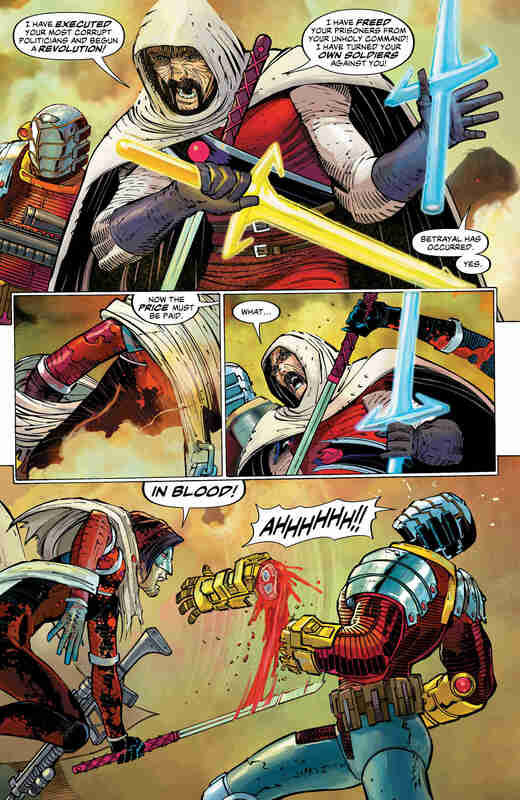 ), and poor Deadshot gets his hand chopped off by Katana because he obeyed Waller’s orders. Ironically, he proves his heroism by saving Waller. The story then closes with a second chapter exploring the consequences, and this second half is frankly far more interesting. Unfortunately, not all the consequences are convincing. I’m not clear why Boomerang kills one of the bad guys “for Hack,” when he was the one who murdered the kid. 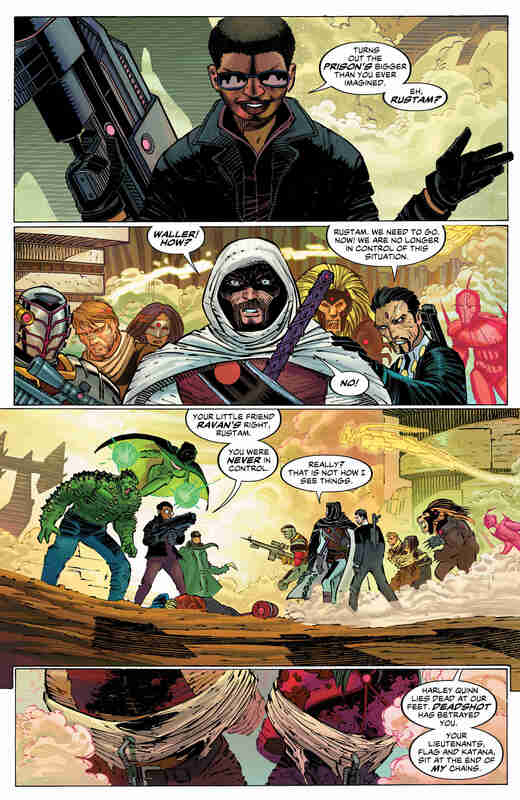 Nor do I understand why Deadshot is so relaxed, when Waller’s distrust and deceit effectively cost him a hand. 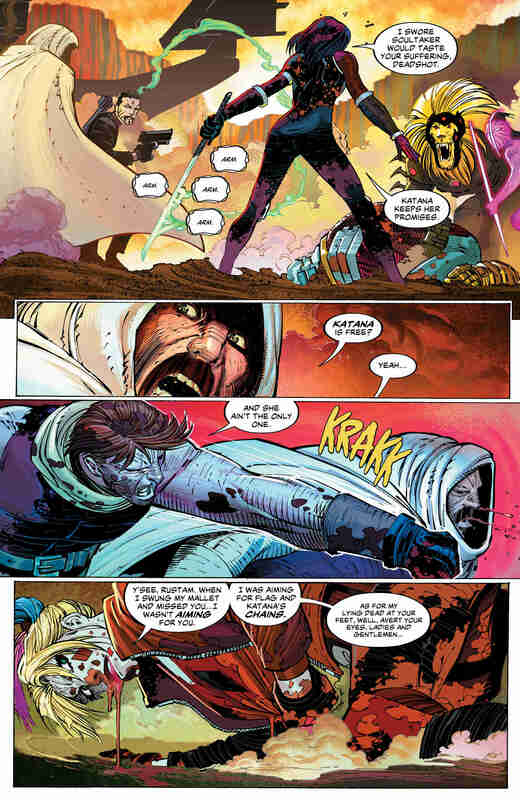 Katana, after all, is one of Waller’s lieutenants; if she’d known about Deadshot’s orders, he’d not have had his hand lopped off. That said, in the middle of all the consequences we have a beautiful character moment, as Waller reflects on the cost of her ‘play dead’ strategy – watching her children grieve at her own funeral. Ooof, that moment is a real emotional punch in the gut – just as it should be. 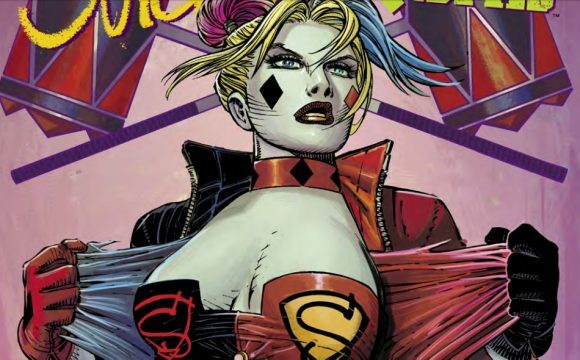 Suicide Squad #15 is a strong issue, but it’s not altogether satisfying. It’s possible the bar had been set too high, meaning the resolution was always going to be a little weaker. Whatever the case may be, though, it’s still worth the read, and the future definitely looks bright.